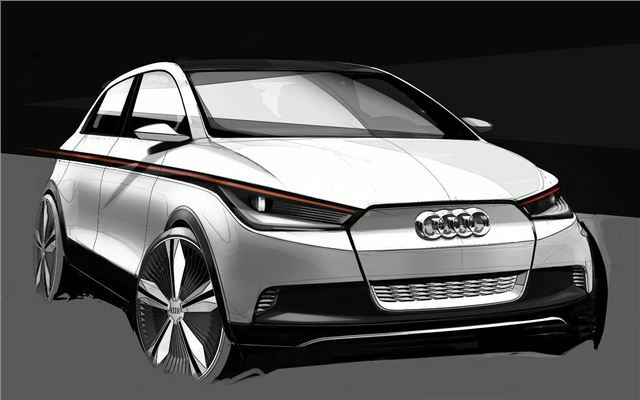 An all-electric Audi A2 concept is set to debut at Frankfurt, and Audi has released the first sketches, which preview what essentially looks like a five door version of the Audi A1. The A2 Concept also shows off some of the upcoming technology likely to feature in future Audi models, including new all LED anti-glare headlights, fibre-optic daytime running lights and laser diode foglights, which project a red warning triangle through the fog onto the road in bad weather. Light is an important part of the A2 Concept – a dynamic light runs along the side of the car below the windows and acts as a sidelight under normal circumstances, or flashes when indicating. It also turns red when braking, with the brightness determined by the amount of brake force. Inside, there is a flat interior floor to maximise legroom, with lightweight materials used to reduce weight. There’re four individual seats, and space between the rear seats for a bicycle. The boot has two levels, separated by nets. The A2 will be revealed in the metal at the Frankfurt Motor Show – stay tuned to the Frankfurt page for more information.